Welcome to another installment of The Seven Questions Series! A huge thank you to Steve Sears for being my guest. 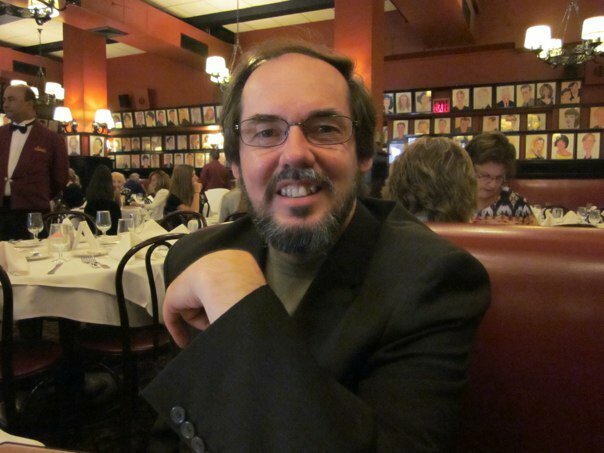 Bio: Steve Sears, owner of SGSWrite LLC, is a full-time freelance writer living in Bloomfield, New Jersey. A freelance writer since 1996, he writes food and dining, bridal and business profiles, has published fiction and poetry, reviews books, and also does commercial writing. He guest and ghost blogs often and maintains his own blog which can be accessed via his website, www.SGSWrite.com. This September, he will be married for 24 years to his beautiful wife, Lucille. Their daughter, 20-year-old Stefanie, is a part-time freelance writer. Steve Sears’ blog at SGSWrite.com will make you hungry. One of his specialties, after all, is food writing, and the way he writes about food is exquisite. You can see, smell and taste the food he writes about, along with feeling the ambiance of the restaraunts he describes, no matter where you live. The blog focuses on four categories: Food and Dining, Freelance Writing, Health and Musings. A large portion of the Musings category are posts called “Saturday Thoughts,” profound and deeply moving ruminations on life, family and writing. One of the hard parts about writing, I think, is not letting our dreams die inside of us, since writers hear often from all over, how hard it is to be a writer. How hard it is to make a living. At times we want to give up and do things that are practical, that will make us steady sure money, that aren’t silly pipe dreams. But those things are also unfulfilling and not really who we are anyway. Steve Sears is proof that you can achive your writing goals and make a living. His blog chronicles his journey and remindes us all to not let the music die inside of us. The Chipper Writer: Tell us how you got started as a freelance writer, and how you made the leap into full-time freelance writing. Steve Sears: That’s a very good question. I always enjoyed writing, was encouraged in both grade school and high school to be a writer, and wrote sports columns for the local weekly while writing for my high school paper. However, it was after I began a 23-year computer operations career that I realized how bored I was doing something that “was necessary.” Then, back in 1996, I had a heart attack at the age of 34. From my hospital bed, I vowed to one day be a full-time freelance writer, and I started as a part-timer during my disability, and worked like that until 2010. I eventually moved to full-time in 2010 when my company outsourced my weekend work to Pune, India, and were prepared to put me on a work schedule I didn’t approve of. I felt the time was right. The Chipper Writer: What is your writing schedule typically like, and can you talk a little about how you manage your time? SS: Sure. Every day I work from a to-do list that I create the prior evening. I normally work from 7:30 a.m. – 5 p.m., and my day is a combination of working on current assignments (writing articles or conducting interviews) and marketing. I’ll normally start the day with articles, have lunch, do my marketing (which my wife, Lucille, helps me with by creating lists from jobs sites), and then finish up with more articles and creating the next day’s schedule. I carefully plan everything so that I am never bored. Boredom, to me, is a freelancer’s #1 enemy. The Chipper Writer: What is the most important thing a new freelancer can learn? I chose what I’m doing for a living, love it, and I claim 100% responsibility for it. I don’t blame externals, and when the roof caves in (and it won’t), it’s on me. Also, it’s one thing to be a hobbyist, quite another to “put your awning out” and shout that you’re open for business. This isn’t an easy thing to do – and I can certainly vouch for that. It’s no game, it’s work – and that includes marketing, networking, paying taxes and your own health insurance in addition to writing — and you have to treat it as such. Also, focus on the type of writing you’d like to do, and read the advice from others who are making a true go of it. The Chipper Writer: What advice can you give to writers as far as writing query letters? SS: Two things: read the magazine, and be professional in your email. That means a properly constructed query letter, detailing why you are the writer for the piece, and what you’ll offer. Also, make sure you have a proper editor’s name to forward the query to, so that it winds up in the proper email box or desk. But most of all, make sure you “know” the publication. The Chipper Writer: I enjoyed your blog post called “The Benefit of a Writers Group.” Can you talk a little about those benefits? SS: Absolutely. I belong to two writers groups, one which is goal oriented with book and magazine authors, the other with budding novelists and fiction writers. We don’t necessarily share work at these meetings, but get together to discuss our writing lives. Even though I can perhaps more relate to the first group than the latter, all the folks in both of my groups are valuable to me. As a full-time writer, you NEED to be among people, especially other writers, occasionally. So, these groups are my escape, but also a well of inspiration. I may benefit from the professional knowledge of the first group, but the folks in the second group (who, by the way, are much better fiction writers than me) also give me advice I seek when I may be at a dead end. In the end, it ties in to my belief that you can be inspired by anyone at anytime anywhere, and nowhere – with the exception of my wife and daughter – do I feel that more than when I get together with my writers groups. The Chipper Writer: You work on your taxes on the second and fourth Saturday of each month to stay ahead. What are some reasons to do your taxes this way? SS: One of the things I least like to do is figure out my taxes and pay them, but rather than put off until tomorrow what I can do today, I break it down. I do it on a Saturday because Saturday is primarily a laid back day (blogging, update resume and website, PC maintenance, etc. ), and keeping ahead of it makes it less “painless” to do when it comes quarterly tax time. The key here is to make things easier. There’s enough work to do with the writing. The Chipper Writer: What books and other resources would you recommend to aspiring freelancers? SS: There are many excellent ones, but here are a few I always reach for when need be. Kelly James-Enger’s $ix-Figure Freelancing is excellent, as is her Ready, Aim, Specialize! Kelly’s blog, Dollars and Deadlines, is also valuable. Also, I recommend Linda Formichelli and Diana Burrell’s The Renegade Writer book and companion blog. What a wonderful wealth of information. If you’re seeking a copywriting career, Peter Bowerman’s The Well-Fed Writer, as well as his blog and newsletter, are super. Finally, read The Writer magazine. There’s something for someone in every issue.